Now is the time for a road trip. For an outdoor centered summer vacation to chase the fishing bite. 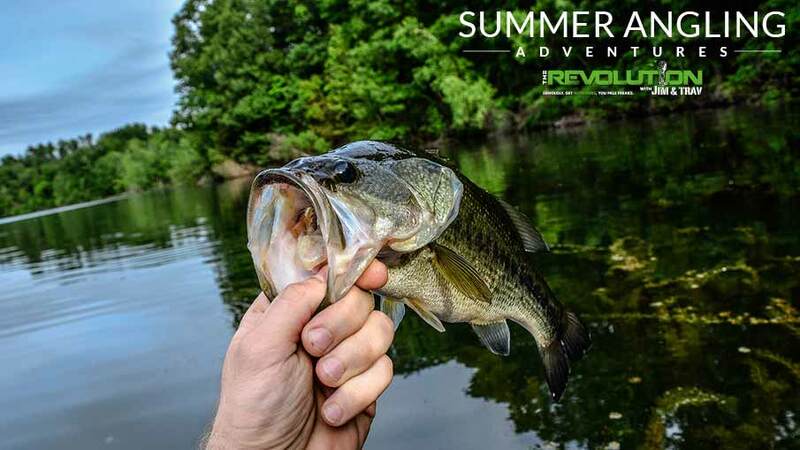 So, this week on The Revolution with Jim and Trav, we’re talking Summer Angling Adventures. Joining us will be Dave Mercer, host of Dave Mercer's Facts of Fishing, plus JP DeRose from JP DeRose Breaking Boundaries! Jim and Trav’s Summer Angling Adventures is presented by Outdoor Channel, Sportsman Channel, World Fishing Network and MyOutdoorTV. Dave Mercer is the host of Dave Mercer’s Facts of Fishing on Outdoor Channel and World Fishing Network. He’s also the The Bassmaster Classic & Bassmaster Elite Series emcee. Tune in as Dave joins us for an extended interview stacked full of tips that will help you find more success on the water. Aquatic vegetation provides great cover and shade for summer bass. However, fishing those grassbeds and weedbeds can be frustrating because many times you end up fighting a wad of junk that builds up on the end of your line. Dave says that when fishing these locations, you have to change your tactics to accommodate the situation on the retrieve. Maintaining steady pressure on the fish is key instead of pulling and forcing it which can lead to pulling the hook or breaking the line. By keeping steady pressure on the line, you can bring the boat to the fish and increase your chances of landing those grass bass. Dave will also highlight the case for slowing down and says this lesson was learned through failure for him. Being rushed, feeling pressured, not thinking – these things can all work against you as you tend to just go through the motions instead of staying focused on what you were doing to catch fish previously. Instead of working fast and furiously, you have to be mindful of your speed and how even the slightest increase in speeds can completely change your presentation. Sometimes, all it takes is a different approach to get the bites you need. Dave says that fish aren’t smart, however, they do get used to things which help them evade an angler’s hook, so he’ll talk about a couple of different approaches to take to change things up. First up, Neko rigging is a popular technique right now that is an adaptation of the nail-weighted worm. Using a weighted worm in combination with a midsection hook position allows the bait to fall slowly but with a unique action that the fish really react to. Dave will explain the benefits of this approach in grass. Next up, microbaiting. The name itself is attention getting but it’s also highly effective. Previously, swimbaits were always large, eight plus inches in length, but now you can get two to three-inch swimbaits as well and these miniature versions are a great way to get a lot of bites. Dave says that microbaiting is a good way to cover water and get reactions because, it’s something different, something the fish aren’t used to yet. While the technique uses “micro” baits that doesn’t mean they only work on small fish. Dave says that they are effective at catching big and small fish and are a great way to take the pulse of the body of water you’re fishing. Finally, fishing a new body of water can be intimidating to some. Whether you’re competing or just spending the weekend with family at a new location, Dave says there are things you can do to maximize your success. To begin with he says you should do a Google search of the body of water you’ll be fishing. There will be a lot of information online so read up! Next, local bait shops can be effective sources of information, but don’t be the goon that goes in and asks where the fish are or what to throw. Instead ask questions like where at in the water column the fish tend to be this time of year and what their forage base is. This information can help you better pinpoint productive locations. Once on the water, it’s not time to fish just yet. Instead, Dave says he takes a lap round the body of water to familiarize himself with what is available, taking mental notes of rocky points, milfoil, pad beds, docks and more. Armed with all this information, then Dave says he picks a location he thinks will be productive and starts with faster moving baits like crankbaits and spinnerbaits to get a feel for the fish. Tune in for tons of tips and a fun talk with Dave Mercer. Be sure to look him up at FactsOfFishing.com and also follow his YouTube channel for more fishing wisdom! What kind of angler are you: rookie/weekend warrior, expert fishing fanatic, or somewhere in between? Regardless of your skill level, when we take to the water we all want the same thing, to catch fish. Having a good understanding of the gear you use and the right circumstances to use it in is essential. JP DeRose is the host of JP DeRose Breaking Boundaries on World Fishing Network and he joins The Revolution this week with tons of tips and information that will make you a more educated and effective angler. Fishing rod powers and actions are many times confused or blurred, but JP says that it is important people understand the fundamental differences. The power of the rod is the amount of force it takes to move an object, so the bigger the fish, the heavier the cover and the heavier the bait you use – then the heavier the power of the rod your using should be. Fishing rod powers range from ultra light to double extra heavy and when choosing the right power, JP says you need to relate it to the size of fish you’re after. So, in essence, the bigger the fish the heavier the power. Next, consider the kind of cover you’re fishing in. If you’re flipping in trees, hydrilla, lily pads or wood, a heavier power rod is appropriate. However, if you happen to be fishing for small mouth in open water, JP says that a medium or medium light power will suffice. The action of the rod is the flex found in the blank, or the taper. The faster a blank is, the less it bends down through the blank and the more it bends toward the tip. Conversely, the slower a blank is, the more it bends from the handle all the way forward. JP will explain the different actions, slow to extra fast, and how to correctly choose the right action for the style of fishing you’re doing. Once you have settled on a rod, the next thing you have to think about is a reel. Mismatched equipment is something JP sees often – an oversized reel on a lighter power rod or an ultra light reel on a heavier rod – and says it’s important you’re aware so you avoid the same situation. He’ll explain line ratings and the importance of matching the line rating of your rod to your reel. And when it comes to reels, he’ll talk about the all new Shimano Curado DC and dive into the amazing features of this brand-new reel and explain how it’s a very user friendly baitcaster, even for those who are inexperienced. Summer time temperatures can leave bass running for cover, so how should you approach bass fishing in hot weather? JP says that cooler night time temperatures can see bigger fish moving back to shallower water for the early morning bite, but when the water temperatures start to rise they head back for deeper, colder water. At the same time, baitfish that are escaping the hot water head for these cooler waters as well. This creates a winning situation for bass as they get the cooler more comfortable water that also has plenty of feed available. JP will also discuss the thermocline and how when using electronics, you can often identify these bands of cooler water to act as an indicator for where you should be focusing your efforts. Be sure listen in for tons of time applicable fishing tips, from JP DeRose, as well as a lesson in selecting the right gear for the species and cover you’re fishing. Also get a teaser of what’s to come on the next season of JP DeRose Breaking Boundaries on World Fishing Network.